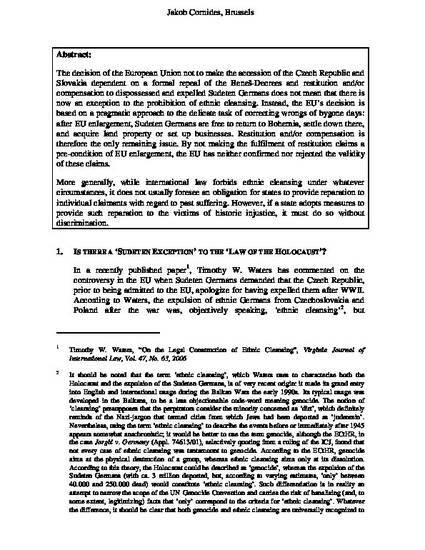 The decision of the European Union not to make the accession of the Czech Republic and Slovakia dependent on a formal repeal of the Benes-Decrees and restitution and/or compensation to dispossessed and expelled Sudeten Germans does not mean that there is now an exception to the prohibition of ethnic cleansing. Instead, the EU’s decision is based on a pragmatic approach to the delicate task of correcting wrongs of bygone days: after EU enlargement, Sudeten Germans are free to return to Bohemia, settle down there, and acquire land property or set up businesses. Restitution and/or compensation is therefore the only remaining issue. By not making the fulfilment of restitution claims a pre-condition of EU enlargement, the EU has neither confirmed nor rejected the validity of these claims. More generally, while international law forbids ethnic cleansing under whatever circumstances, it does not usually foresee an obligation for states to provide reparation to individual claimants with regard to past suffering. However, if a state adopts measures to provide such reparation to the victims of historic injustice, it must do so without discrimination.